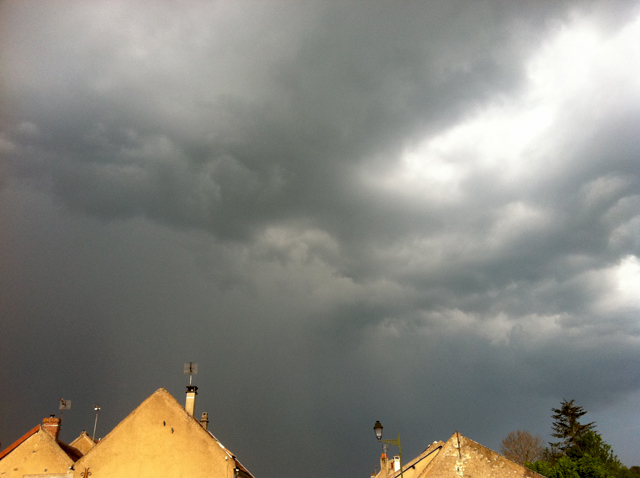 Post #6 from our Easter week in Burgundy. Everything smells different right before it hits. The light changes. The temperature drops. Things are hushed, then windy. 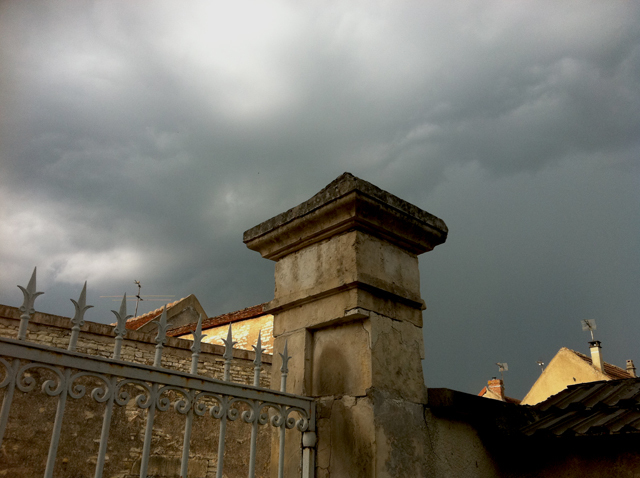 The gray grows in intensity overhead, while underneath roiling clouds, beiges turn to gold. The children start to dance and sing. We are, after all, electrically wired beings and this event is as much inside us as it is outside. I love these moments before the rain starts. Or the hail. Or the lightening and thunder. Everything is turbulent. Air as well as emotions. We feel happy, ecstatic (there’s that internal electricity again), as if our internal coils have been let loose from being wound too tightly all day under listless, humidity-laden skies. This storm reminds me of one we had last summer, the likes of which I personally had never seen. It scared me, but it was too thrilling not to watch with its fake-looking, Dr. Seuss clouds. I always tell myself that if anything serious should hit, we’d take cover in the cave and drink wine until either the storm is over or our nerves can handle whatever comes next. Isn’t that what wine cellars are for? 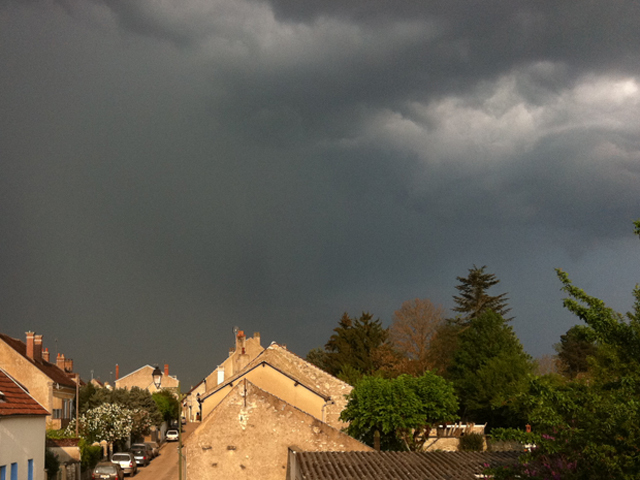 This entry was posted in AROUND US, FRANCE and tagged Burgundy, France, spring, storm. Bookmark the permalink. 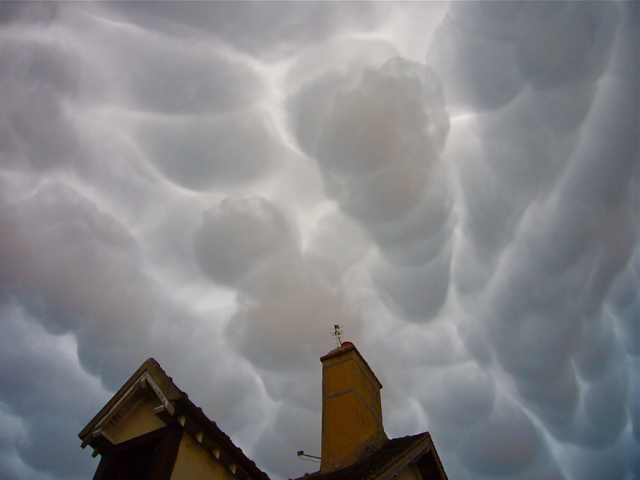 Amazing clouds – they don’t look real. 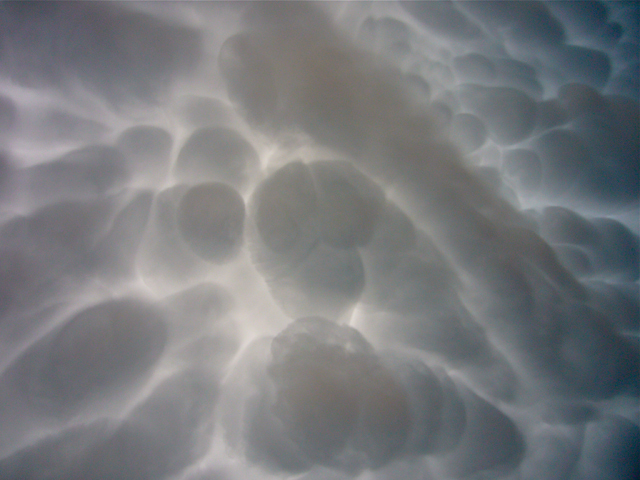 naturally, i LOVE the image of the clouds, solo, overhead, nothing else…..looks like it could be part of the brain. i always feel like, right before a big looming storm, the air starts rushing UP. the energy seems to NOT be affected by gravity the way bodies, weight, and every-day heavy thoughts are. things (thoughts, energy, leaves, ions….) go UP! I’m reading the autobiography of Ben Franklin. He would have loved these clouds and your descriptions of their effects on us. I would LOVE to read his autobiography, and I’m embarrassed to say that I didn’t know he’s written one. Is it difficult to read? he’d not he’s. my fingers are prone to error.